Digital Station #6 was purchased with funds on a Shared Instrumentation Grant to meet the needs of multicolor FISH and other multiprobe high resolution light microscope applications. This is a dual use instrument. 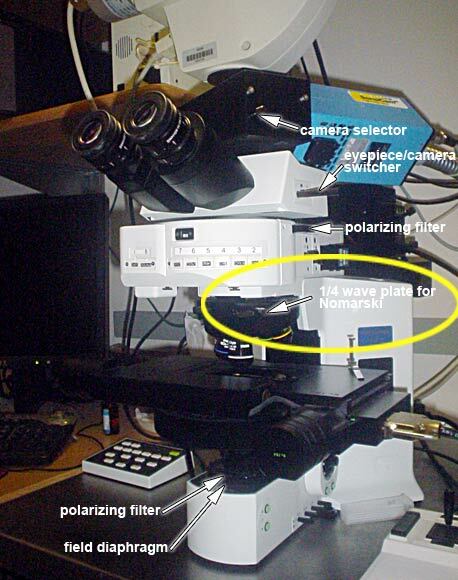 The microscope may be driven by the SKY software or by IPLab. The information on this web page is for IPLab use only. These instructions are for using the system with the Cooke Sensicam CCD camera only. ALL OF THESE INSTRUCTIONS MUST BE FOLLOWED FOR THE SYSTEM TO OPERATE. TREAT THIS AS A CHECKLIST. PRETEND YOU ARE CHECKING OFF FOR THE LAUNCH OF YOUR ROCKET SHIP. YOU DON'T WANT TO CRASH OR EXPLODE. 2. The correct filter turret must be installed in the microscope. This is the correct turret. Note that there are 8 positions. If this is not the wheel installed in the microscope, you must switch to the other wheel. Click here for instructions how to do this. 3. Black box on top of computer must have knob set to "B". 4. Turn on the electronically controlled microscope stage. 6. Turn on the cooled CCD camera. 7. The computer is usually left on. Check the screen is on and wiggle the mouse or hit the keyboard to see if computer is sleeping. If the computer is not on, turn it on. Click Here for Function Keys. Please change the objective by using the point-and-click menu or by the keypad. Before changing objective, make sure to lower the stage so that the lens may crash and destroy your sample! The button marked "ESC" drops the stage. Pressing it again will bring the stage back to the same position. What you see by eye through the microscope occulars is a mirror image of what you see on the computer screen. Also, the image on the computer screen is only the center portion of the full field you can see by eye. 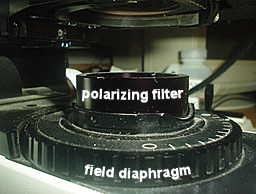 There are four filters that must be adjusted properly for DIC microscopy. Polarizer on bottom directly above the field diaphagm. 1/4 wave plate in condenser, computer controlled. First, the sample must be in focus and set for Koehler illumination with the field diaphragm at the edge of the field and the iris diaphragm (computer controlled) fully open. The polarizers must be crossed with the two 1/4 wave plates out of the light path. Then both 1/4 wave plates are reintroduced into the light path for DIC. The iris diaphragm inside the condenser may be adjusted via computer for increased contrast.